If you are looking for the best drill press under $500 then you’ve landed at the right place. When purchasing shop equipment, the most popular tools always stand out. However, while all the hype surrounding redesigned and more accurate tools increases, the high quality of a drill press never flounders. While some may see the drill press simply as a stationary version of a portable, handheld drill, this is certainly not the case. Portable drills are often designed for more than boring holes, as they have reversible motors and varying speeds. Even though these alterations definitely make portable drills attractive to the customer, they do not live up to any of the best drill presses. The high levels of torque, and unbeatable control and accuracy supplied by a drill press make this tool a necessity for any serious craftsman. The common models of drill presses come in two varieties: floor models and bench top models. Most home shops will find that they do not require the high capacity of the floor model, and will discover a bench top model will more than qualify for the job. These compact drill presses are not only high quality, but affordable as well, leaving your shop, and your wallet, happy. Below are some of the best drill presses under $500 which are worth checking out. 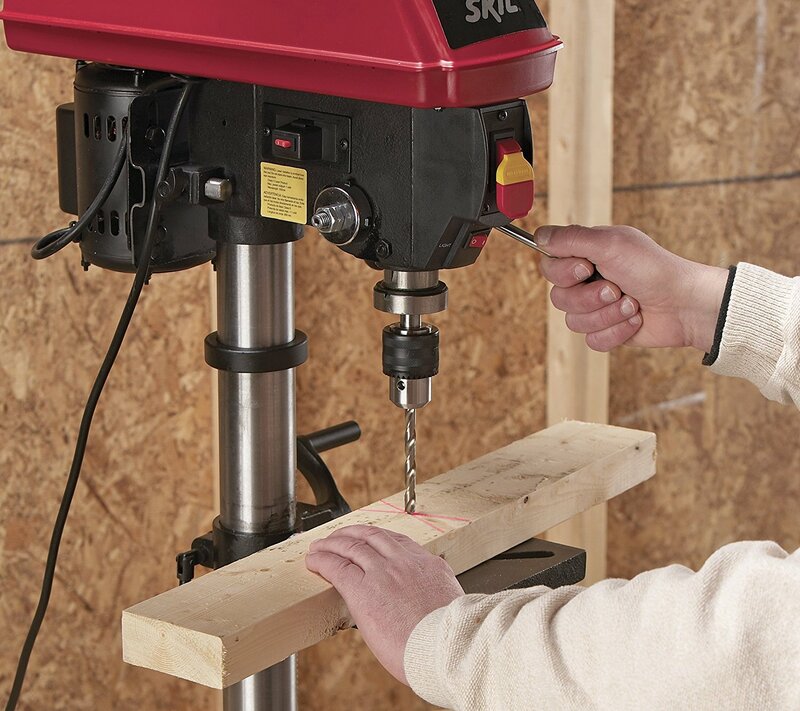 As the most pocketbook friendly of our best drill press options, the Skil drill press costs a mere $120. As a 10 inch bench top model, this drill may be perfect for the beginning craftsmen. With a slightly limited five speeds between 570 and 3050 rpm, this drill press is perfect for medium to light home usage. Any run out is undetectable, and the lasers are reviewed as high quality in assisting with the drilling. A bit on the lighter side, opposed to other drill press brands, the Skil drill press still is reportedly sturdy enough to not shift at all despite the vibrations. This tool lives up the cliche, providing more bang for the buck than expected. The handle locks in to a certain depth for projects that require a repeated depth of drilling, and the table has a tilt feature that may come in handy when you want the vise to turn sideways. The manual change required to adjust the speed setting may repel some more serious customers, as the tension belts must be moved around by hand. The laser powered batteries also draw negative customer reviews, as the drill itself is more conveniently equipped with an electrical cord. However, the safety key feature resembles those of more expensive brands, ensuring that the drill press does not start without warning. For the average craftsman, the Skil 3320 may perfectly suit your needs. This is what we found to be the best drill press under 500 dollars. It is also rated as the best seller on Amazon. With the pricing at $350, the Shop Fox drill press has the highest level of versatility offered for the cost. Not only is there a 5/8″ chuck and 3/4-hp motor, but the ability of the Shop Fox to morph its design into an oscillating spindle sander separates it from the rest. This combination of two tools in one drill press feels heavy duty and has a great amount of power for the workbench variety. Similar to other models in its double hex nut depth stop, this tool has many other added features as well. The table has a spot for sanding drums, and comes standard with a set including sandpaper. The dust port helps contain any debris from the sanding. The unusual side placement of the on/off switch may throw users for a loop, but there should be no added safety issues with this design. While its other features may be a step ahead, the Shop Fox drill press does not allow for the easy changing of belt speed. The motor must be adjusted manually, without the support of a lever to change the belt tension. The spring loaded stop is only available on the front, and makes the process of determining tension tricky. Lack of a work light also was the subject of several negative reviews. The first on our list of top five drill presses you can get for under 500 dollars is the Grizzly G7943 which is also below the $300 mark, making it one of the cheapest yet effective drills. The quality of this Grizzly lives up to the name, even at it’s bench top size of 12″. This machine weighs in at a hefty 142 pounds, and is built with sturdy cast iron making for an extremely heavy duty drill press. The accompanying 3/4-hp motor and 5/8″ chuck boast its no-nonsense reputation. The manual task of switching between the 12 speeds of the tool is reviewed as easy to handle, as a lever slides the motor back and forth. 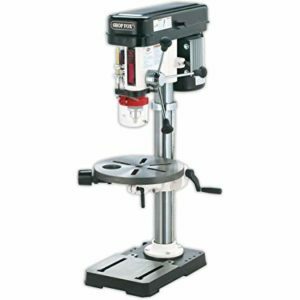 This top rated drill press ranges from 140 to 3050 rpm, sure to satisfy the needs of any customer. The lock depth settings are secure fastened with twin hex nuts, and routine adjustments are a simple task on all controls. While no light bulb is provided with this purchase, the built-in socket accepts bulbs of up to 60 watts to ensure a bright drilling area. This small complaint in drill press reviews is easily overlooked when considering the other high qualities offered by the Grizzly G7943. This press has a wide variety of features, especially for its cost of around $400. The Digital Speed Readout (DRO) feature, proves to be more useful than depth indicators of other brands. Functional LED lighting is included, and are bright enough to ensure maximum viewing ability. However, the LED lightning is not battery powered, and therefore cannot be replaced if its lifespan runs out. Even with this lights on, the lasers are easily seen, optimizing the quality of work. The standard of safety in the Jet drill press is clearly top notch. The chuck key is spring loaded, which prevents the user from accidentally leaving it in the chuck. To tighten or loosen the chuck, inward pressure must be applied on the key, as otherwise the chuck key will be pushed out of the chuck. The on/off switch on the front of the drill press can be found on the front of the drill press, and makes emergency shut off a quick option when necessary. This drill press also allows the user to change the drilling speed without changing the location of the belt on the pulley. A handle located on the left side of the tool can change the speed, with the rpm shown digitally above the on/off switch. Running between 500 and 3000 rpm, this high quality product repeatedly receives rave reviews on its large range of features for the small price. 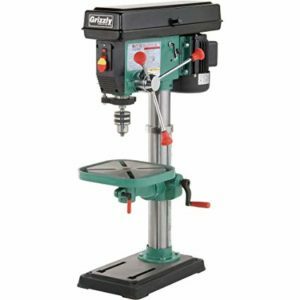 Unless you are looking for a tool that can handle much slower than the offered 500 rpm, the Jet 12″ Bench Top Drill Press is sure to be a hit. Standing tall above the rest, this large bench top drill press is under $500. Weighing around 120 pounds, the tool feels extremely solid, and is crafted out of cast iron and steel. The small amount of run out is nearly undetectable, which is a bonus for this surprisingly accurate machine. The Rikon drill press lacks any fancy add-ons that may typically be available with other brands, and the lack or a light and laser sights may avert some potential buyers.The attached table is quite small, which is only an issue if your work surface does not already meet your needs. The drive belts are fairly simple to change, and the addition of a speed chart placed on the inside of the top cover makes this an even easier task. The unit is very quiet for such a large tool, and assembly is not especially difficult.During assembly, you may notice that despite its durability, the cast iron feed handle is placed in a poorly designed location. Users should be forewarned that fingers are apt to be bashed on the tension lever. While this issue can be resolved by replacing the feed handle with one designed for the 30-140 model, you may not want to go through this extra hassle for a pain-free drilling experience. Drill presses are crucial, especially for anyone doing some DIYs and a little carpentry, either at home or at work. And if you are going to spend $500, you should be getting something of good quality. Although most high end and powerful drill presses goes even beyond the $1,000 mark, these are some that we found to be worth every penny under $500.